This article first appeared in The AMSAT Journal, Jan-Feb 2006. It is reproduced here thanks to the kind permission of Ray Soifer, W2RS. Now wait a minute, you say. Don’t ground plane antennas such as that have a null at the zenith, and aren’t satellites up in the sky? Don’t you need an upward-pointing antenna? I’ll let you in on the dirty little secret of elevation rotors and all that complicated stuff: with low-earth-orbit (LEO) satellites such as the ones we’re talking about, most of the time you don’t really need to elevate your antenna at all unless it’s got a lot of gain. 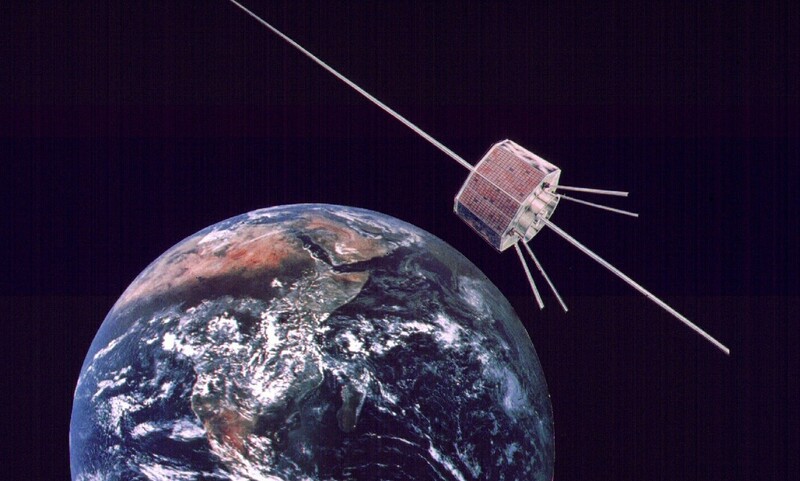 The specifics will vary slightly with your latitude and the orbital inclination, but a satellite in approximately polar orbit at an altitude of 800-900 km, such as FO-29 and VO-52, will have an elevation angle of 60º or more only about 1% of the time during which it is within sight of your station. Its elevation will exceed 30º only about 10% of the time it is within range. Even AO-7, at an orbital altitude of 1500 km, will have an elevation angle of 60º or more only about 2% of the time. I’ve had my KISS mag-mount whip up and running for a month now, and it provides good coverage of satellite passes when the elevation angle is between roughly 10º and 60º. A longer whip, with more gain, wouldn’t get coverage as high as 60º elevation. The lower the elevation angle, the farther away is the satellite from your station, and signal strength varies inversely with the square of the distance. So, for low elevation angles, substantial antenna gain is required. To get reliable coverage below 10º elevation, you would generally want a beam of some sort: depending upon terrain, my Arrow hand-held beam can work satellite passes down to about 4º or so, while the long yagis at my old QTH could get down to 1º. You cannot point a beam from the comfort of your shack without a rotator, however, so it fails the KISS test. With our KISS antenna, you don’t even have to know in which direction the satellite is, as long as it’s within range. What about Faraday rotation? Yes, I do notice some nulls from time to time, when the signal to or from the satellite is horizontally polarized. Most of the time, though, that’s not a problem. Satellites nowadays receive and transmit mostly elliptical polarization, so there’s usually enough vertically-polarized signal to get through. Besides, fixing Faraday rotation entirely would require you to have switchable polarization at your antennas, which also fails the KISS test. As you’ve probably gathered by now, there ain’t no free lunch in the satellite biz either. In return for using so simple an antenna system, we are in effect giving up access to the satellite for roughly half the time when it is in sight: at elevation angles below 10º or above 60º, and the relatively few times when the polarization is purely horizontal. But isn’t 50% satellite access better than 0%? If you’re fortunate enough to have a radio that covers both bands (145 and 435 MHz) with full-duplex operation through a single antenna connector, you may not need anything more than that dual-band antenna. However, since I have a separate transceiver for each band, I needed one more piece of equipment to bring my KISS satellite station to life: a duplexer. I saw a few at the hamfest, but they were of uncertain parentage and power-handling capacity. So, I decided to splurge and ordered a Diamond MX-72N, which is rated at 150 watts CW on 145 MHz and 100 watts CW on 435 MHz. That set me back another $50 but my KISS satellite station is now complete. The duplexer works surprisingly well, with very little desensing of the 435 MHz receiver while transmitting on 145 MHz, even with 150 watts. At my QTH, I found the receiving preamplifiers built into the two “brick” amps to be quite adequate to hear the satellites, even through the duplexer and approximately 40 feet of coax. If you have a long run of cable, or an especially noisy receiver, you may find that you need an antenna-mounted preamp, particularly on 435 MHz. That would require mounting the duplexer at the antenna, placing the preamp in the 435 MHz line, and running two coax cables down from the roof. (Again, be sure that the transmit/receive switching system in the preamp is capable of handling your power level.) However, placing the duplexer in the shack and using just one coax cable to the antenna works well for me. So how did my KISS station do in Straight Key Night on OSCAR? Great! I worked five SKN stations on FO-29, three on AO-7 and two on VO-52. I’ve been enjoying satellite passes with it ever since. See you on the birds!